Of the 49 islands which constitute Orkney (not ‘the Orkneys’, or the ‘the Orkney Islands’), Hoy is the 2nd largest, after the island called Mainland. 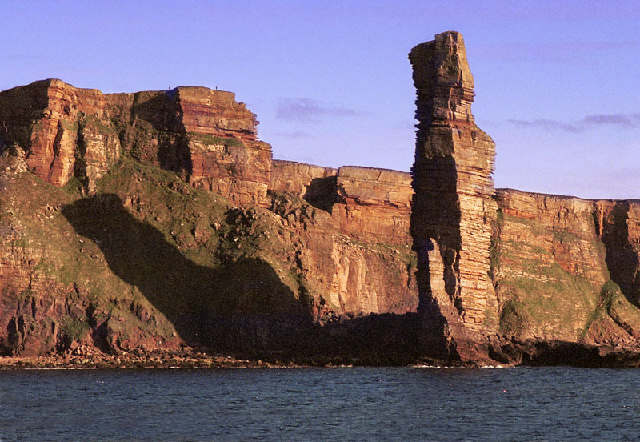 It is only 14 miles by 6, but even so you will have to walk a good 6 miles to have a look at the Old Man of Hoy, a 450-foot-high columnar stack of red sandstone, cleft from the rockface by the unending force of seas. The first known climb, in 1966, took three days. It can be seen from the mainland of Scotland, but if you were to get this far on Hoy itself, a walk just a little to the north of here would reward you with a view of Orkney, Shetland and Caithness. Old Man of Hoy is a real hidden gem and off the beaten track, contact Ireland & Scotland Luxury Tours now to organise your chauffeur driven tour of Scotland.